Donated by: Four Corners Historical Monument Project, founded by former Bloomfield Counselor Kevin Mauzy. 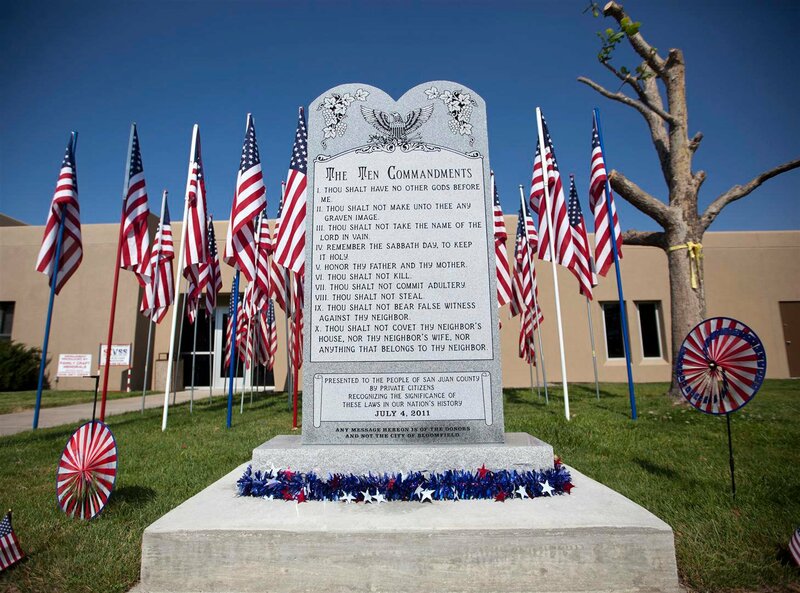 Feb. 8, 2012 – The ACLU of New Mexico, representing Jane Felix and B. N. Coone, filed a complaint in the U.S. District Court for the District of New Mexico against the City of Bloomfield and others alleging that the City’s display of a Ten Commandments monument in front of its municipal building violated the Establishment Clause of the First Amendment. Felix v. City of Bloomfield, (D. N.M., filed Feb. 8, 2012). Nov. 9, 2016 – The U.S. Court of Appeals for the Tenth Circuit affirmed the decision of the district court. Felix v. City of Bloomfield, 841 F.3d 848 (10th Cir., Nov. 9, 2016). Feb. 6, 2017 – 10th Circuit denied Bloomfield’s petition for rehearing en banc. Felix v. City of Bloomfield, (10th Cir., petition for en banc hearing denied, Feb. 6, 2017). July 6, 2017 – Alliance Defending Freedom, representing the City of Bloomfield, files a petition for certiorari before the U.S. Supreme Court. City of Bloomfield v. Felix", (Sup.Ct., filed cert. pet., July 6, 2017). Oct. 16, 2017 – The Supreme Court declined to hear Boomfield’s appeal in the matter of a Ten Commandments monument in front of City Hall. The order let stand the Tenth Circuit’s decision affirming the district court’s ruling that the City violated the Establishment Clause and order to remove the monument from city property. City of Bloomfield v. Felix, (Docket No. 17-60, cert. denied Oct. 16, 2017) (p. 4).